In the spirit of Berger’s novel “G”, I’m offering this blog another recommendation for an experimental novel from 1972 written by someone named John. 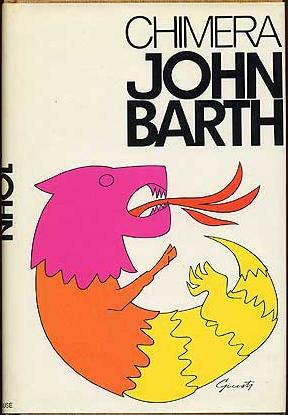 In this spirit, I’ve selected John Barth’s “Chimera.” While technically a novel, “Chimera” is actually three loosely connected novellas based on interpretations of classical stories. The first novella, the “Dunyazadiad” offers a great lesson in short fiction, as it does so much in what amounts to well within the length of longer short stories, and I highly suggest checking out this story even if you don’t read the rest. I chose this work because it functions as a master-class in incorporating meta-fiction into narratives, where self-referential story telling is incorporated at every level, even going so far as having the author himself appear as a djinn to relate the Arabian Nights from memory. Its insanity and that’s why it’s so great. What I love about this story is that while at first it may appear obscure, inaccessible, and even incoherent, once you understand its internal logic, it becomes a joy to discover how this author’s passion for literature becomes expressed in such fresh and interesting ways. The book is also appropriate for a fiction writing class because on top of its extreme narrative techniques, it also tells a fascinating story about the relationship between storytellers and those that care to listen. A relationship that goes back to antiquity. Its also my personal belief that, fortunately or unfortunately, every writer contemporary to our current age has to confront the strange beast of fiction itself in one way or another, not to say that your methods have to be as explicit as Barth’s.